You want a bowl of this spicy, tomato-rich Shellfish Cioppino, seriously. Having moved to the West Coast recently, I have become painfully aware that not only is fresh seafood readily available, but it’s constantly calling my name. It all starts with me just looking at the seafood. I find myself walking to the nearest fish monger, which is about a half hour away, just to see what they have. “It’s good exercise,” I tell myself. Which indeed it is, but I’m starting to feel like I finally understand window shopping. And I’m sure they think I’m a little out there. I look, ask questions, then politely leave and trek back to my place, promising myself that next time I will buy something. After torturing myself for awhile, I can’t take the beckoning any longer and I decide to splurge and cook something grand. It could be my Spicy Korean Seafood and Vegetable Stew, my Seafood Seaweed Coconut Stew, or what I’m sharing with you all today, a delicious rustic Shellfish Cioppino. 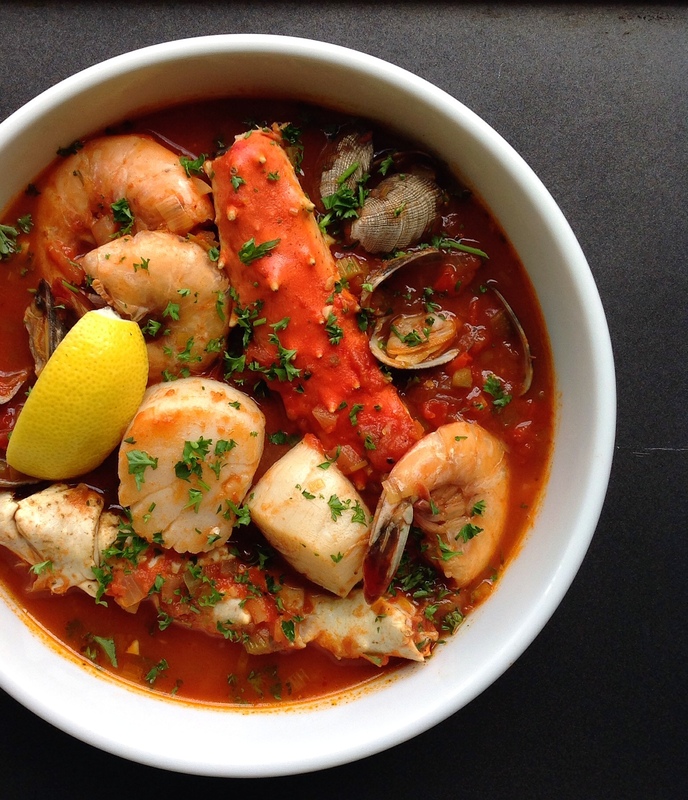 Cioppino is an Italian-American seafood stew originating in San Francisco in the 1800s. Fishermen took what they had left from the day’s catch and tossed it in a communal stew pot. The tomato base has its influences in the traditional Genoese fish stew called burrida as well as the Provençal fish stew bouillabaisse. It was one of those dishes that was different every time it was made. And that’s typically how I made my version, on the fly, without a recipe and with whatever I fancied. Sometimes I’d go heavy on the Mediterranean influences and add saffron and fennel. Or I’d get fancy and roast a bunch of vegetables first. Other times I’d keep the broth thin and delicate with basil. Hey, I was keeping with the spirit of the original fishermen! It was that constant experimentation that led me to recipe you have before you. When I got here, I stopped tweaking. I scribbled my notes in my stained kitchen notebook and didn’t look back. To this day, I’m not even tempted to mess with it, which is rare for me. The broth is perfectly heavenly. It’s heavy on the aromatic vegetables and thick with tangy sweet tomatoes. In fact, I include three different tomato products and I’m not shy with them at all. I also prefer to keep my cioppino all shellfish. While I love fish in stews, there is something so indulgent about a shellfish medley. I love the extra flavor their shells and juices add to the broth. It doesn’t hurt that shellfish are some of the most nutrient dense foods we have available — high in minerals like selenium, which is needed for optimal thyroid function, and the immune system booster zinc, just to mention a few. My secret ingredient is a brief sprinkle of Southeast Asian fish sauce (one of my favorite brands can be found here). It’s actually not that far fetched as Asian fish sauce is salted and fermented anchovies. And, as you may know, anchovies are kind of a big deal in Italian cooking. In fact, if you are lucky enough to have any Italian markets near you, you will be able to find bottles of anchovy juice. So if you prefer you can use that, or just smash up a single anchovy and add it to the sauce. Either way, you adding a dose of flavorful umami that enhances and deepens every single flavor in the dish. I recommend you give it a try it in this dish as well as your other Italian dishes. Shellfish is particularly rich in nourishment, and is among the richest sources of B vitamins, minerals and vitamin D available to us. It is also a good source of iodine. In Dr. Price’s landmark book, Nutrition and Physical Degeneration, he describes how shellfish play a critical role in the traditional diets of ocean-going peoples all across the world. The center of this cioppino is, of course, shellfish. While you can pick up good-quality shellfish in many markets, you can also order it online here from a company that specializes in sourcing exclusively from sustainable fisheries. Shellfish, in general, are considered a “best choice” from Seafood Watch, which examines sustainability of seafood. Look no further, this Cioppino recipe has been tweaked to perfection. Thick with tangy tomatoes, overflowing with fresh vegetables and four types of briny shellfish. The secret ingredient may surprise you. In a large heavy bottom pot heat butter and olive oil over medium high heat. Add onions, leeks, celery, bay leaves, and a pinch of sea salt. Let vegetables soften and become translucent, about 7 minutes. But careful to not let them brown, lower heat as necessary. Add red and green bell peppers and let cook down for an additional 4 minutes. Lower heat to medium and add garlic and dried spices. Stir frequently and allow spices to become very fragrant and sauté for about 3 minutes. Deglaze with white wine and add seafood broth, clam juice, strained tomatoes, chopped tomatoes, tomato paste, and fish sauce. Bring to a boil, then lower heat to lowest setting. Taste and add salt as needed. If you are starting with a homemade seafood broth, then you will probably need to add more salt; a flat taste is a good indicator. Allow sauce to cook uncovered for 20 minutes. Stir intermittently, careful to avoid scorching or sticking. Add crab legs and let simmer while covered for 5 minutes. Then add shrimp and clams and cook covered until the clams open. Lastly, add scallops and cook until firm, about 3 more minutes. Sprinkle with chopped parsley and serve immediately with lemon wedges and starch of choice (sourdough is mighty good, but a side of potatoes or rice works). Don't forget plenty of napkins! Man, I had cioppino in San Fran last year and it was just to die for. I great up in FL with all the great seafood and it’s one of the top things I miss about living in the Midwest. I am definitely bookmarking this for a rainy day! I hear you, this totally scratches that seafood itch. When that rainy day comes, let me know how you like it. Thanks so much for sharing this recipe. This is perfect for a special occasion dinner! I am allergic to scallops but can have all other shellfish… What would you sub for the scallops? This sounds delicious! Hmm. I would suggest that you do fish as the replacement. Go for a sweet and firm white fish, like halibut. If you aren’t trying to replicate the flavor of scallops then any shellfish that you enjoy would work too. Mussels, squid/octopus- all great. I am so excited to try this! I love seafood but admit that I haven’t dived much into shellfish – especially in my own kitchen. I’m glad to see all the veggies that go with the fish too – then you don’t have to feel guilty about all the indulgence that goes with rich seafood. Thanks so much for sharing! Now I just need a really good seafood broth. Suggestions? I would suggest that you make your own. Either on the stovetop or in a pressure cooker. Fish carcass and heads are great and usually cheap to free from most fishmongers. I also like to keep a baggie of shrimp heads and shells (harvested from previous meals) in my freezer ready to be made intro shrimp broth. 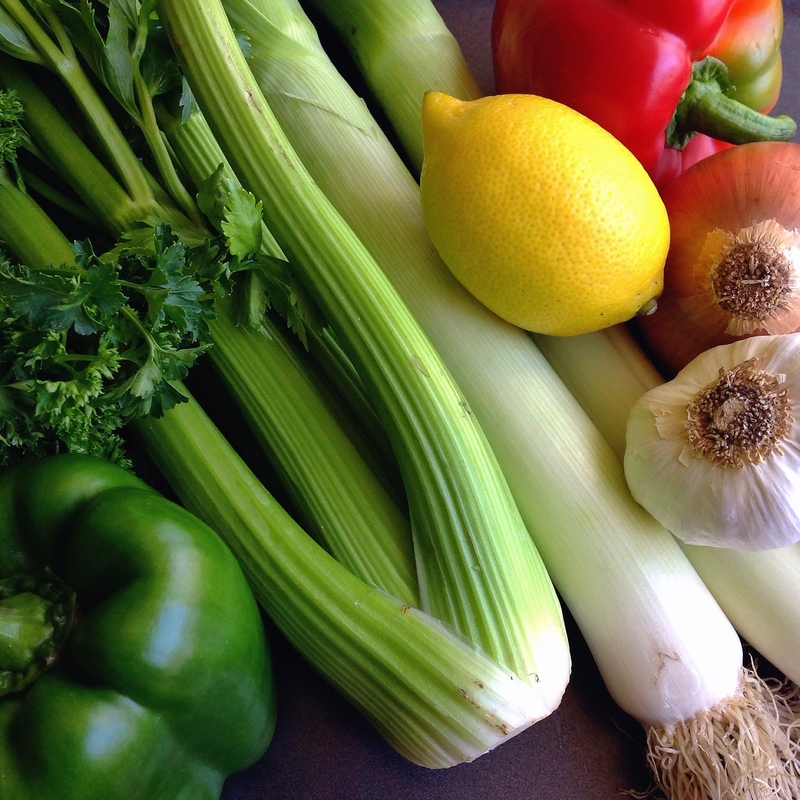 I also like to add lots of aromatic veggies: fennel fronds, celery bits, scallions, cilantro and parsley stems, leek tops and roots, and onion skins. There are some higher quality seafood broths available to purchase in the freezer section of some specialized markets, but if you can make it at home, it will make the world of difference. Are the diced tomatoes fresh or canned. Are the strained tomatoes all liquid that you can buy or are they tomatoes that you drain or strain the juice from? When do you add the anchovies ??? All of the tomato products I used are in glass jars. Strained tomatoes are kind of a cross between tomato sauce (unseasoned) and crushed tomatoes. They are called “strained” because the tomato seeds/skin have been removed leaving you with a smooth, thinnish sauce. They make a great base for sauces. Many Italian brands carry this type of tomato and you should be able to find it at your grocery store, if not an unseasoned tomato sauce will work. Add the anchovy (singular) when the recipe calls for fish sauce. Start with a little and taste before you add more. I love the idea of adding fish sauce! This beautiful bowl really sounds amazing; I crave this kind of food in the summer, too good! Do you make a Shrimp Boil? Wonderful recipe. I sure can’t wait to try it. And the fish sauce is inspired! I just read a reference to meats and sausages seasoned with fish sauce being eaten throughout the Roman Empire, so it totally makes sense it would work in Italian cooking. Thanks so much for idea!